I qualified as a nurse with a degree in Veterinary Nursing from Middlesex University in 2004. 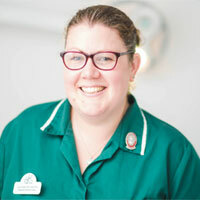 I’ve worked for charity organisations in my hometown of Birmingham before moving to Bridgwater in 2008 to further my career in a veterinary hospital. I love all aspects of nursing but have a passion for rabbit care and welfare. At home I have my own menagerie, including 5 cats, 3 dwarf lop rabbits, 2 leopard geckos and my boyfriend has numerous royal pythons and boas. During my spare time, I volunteer for The Cinnamon Trust and enjoy yoga.